In a sentence prepositions show the relation of one word to another word. Prepositions require an object to complete them, typically a noun or a pronoun. 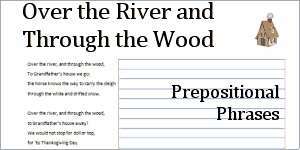 A preposition and its object is called a prepositional phrase. Don't miss the Bingo Game! If any of the words in the table below do not have an object when used in a sentence, then the word is not functioning as a preposition. The words below can be used as a preposition in a prepositional phrase. The advantage of being able to recognize prepositional phrases in sentences is that neither the subject nor the verb will ever be a part of the prepositional phrase. Consider this sentence: "The coat on the chair is mine." If we eliminate the prepositional phrase, "on the chair" then we can easily see that coat is the subject and is is the verb. "The coat on the chair is mine." Note: Prepositions do not change form. Prepositions are not without evaluation challenges. For instance, a preposition paired with a verb is called a phrasal verb, a preposition can follow, rather than precede its object. Curriculum: A workbook series called Easy Grammar takes advantage of prepositions in sentence mark-up. You can read about how to make a lesson plan series for the curriculum Planning Easy Grammar at donnayoung.org. An activity to learn prepositions is playing preposition bingo. This game was devised by the author of the Easy Grammar series. There are additional printable bingo cards on this web-site on the Preposition Bingo page and at Fancy Preposition Bingo. The children's book, Bears in the Night (Berenstein Bears), is full of prepositional phrases. Your public library might have a copy of this book. Below are two more books. Links go to amazon.com.